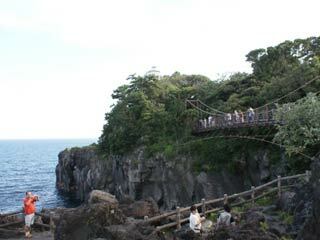 Cape Jogasaki (城ヶ崎) is a popular sightseeing spot in Ito, Izu Peninsula. It is a cape made from the lava of Mt. Omuro. There are a lighthouse, a cable suspension bridge, and caps which all of them has great view of Pacific Ocean, Izu Peninsula and Izu Islands. The light house closed at 17:00.